We received a request for a playable lighted wooden dollhouse decorated in earth tones, orange, gold and black... Here are some pictures for you to get ideas from... in case those are the color tones your child (or you!) likes too! Cute! 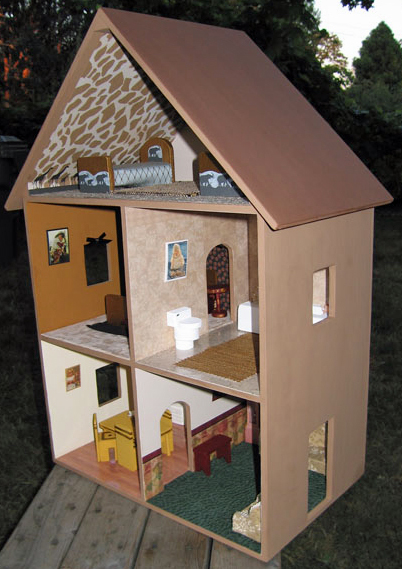 Desi's doll house, that we had you make at Christmas, turned out very cute. How ever we just painted and put flooring in, nothing elaborate like pictures on the walls yet. 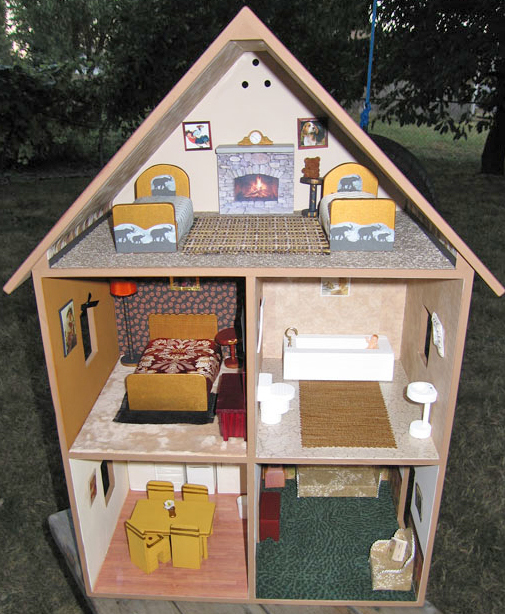 I bought the fisher price furniture and painted some that came with the houses (we have a small one of your houses from last Christmas of 2009). I love it more than she does. It was a fun project for my husband and I during the holidays. I love this idea! I was thinking of trying something similar in my dollhouse, but I use cardboard and was afraid it might get too warm. 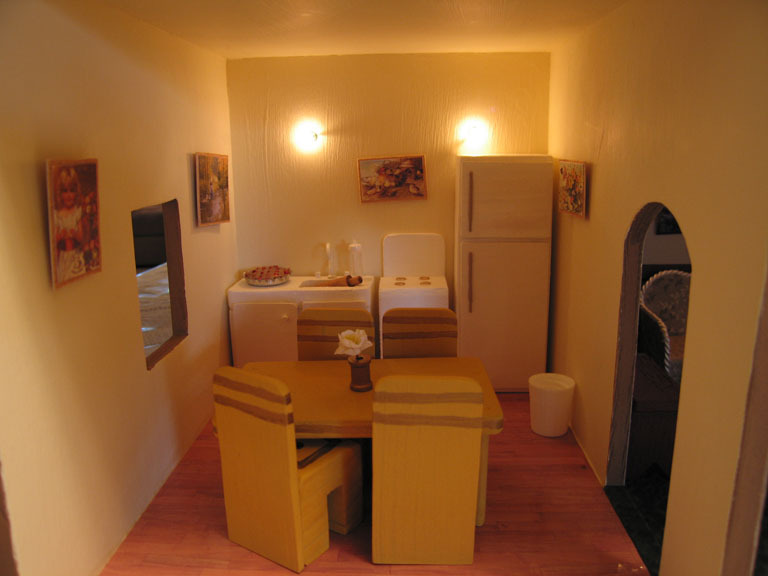 Do the lights get hot after a while, or do you think twinkle lights would work on a cardboard dollhouse? Most Christmas lights are made to not get hot, so I think it would be possible... but to make sure you could take a piece of your scrap card board, poke holes in it, push some lights through and monitor them for a few hours. Let us know how it goes! Or send a picture! Those LED lights don't heat up. They're wonderful. This is a great design! Where have you hidden the battery pack for the lights? Looking for ideas for my bookcase conversion project. Thanks. 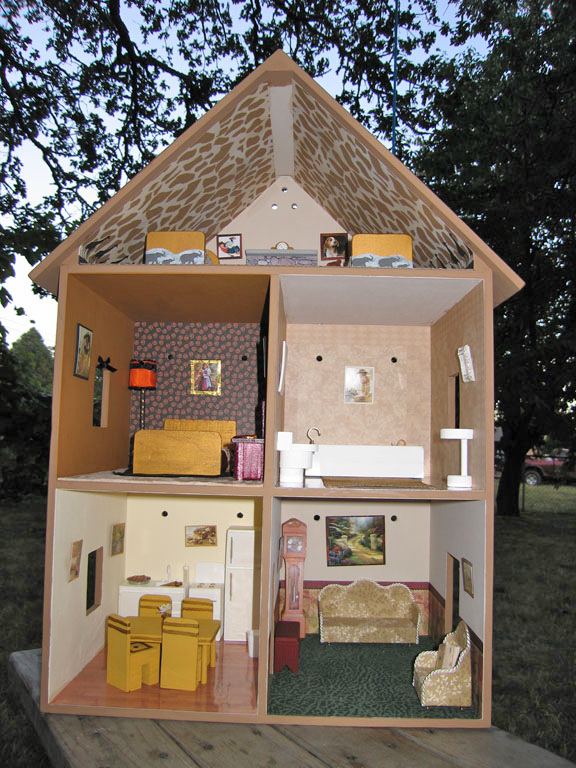 The dollhouse on this page uses a regular strand of lights, plugged into a wall outlet. If you want to use a battery powered pack of lights, you could hot glue Velcro to the back of the bookshelf-dollhouse as well as to the battery pack, and attach it that way. The only thing we've done with a battery pack is a very small one scene dollhouse (reference this link: http://dollhousedecorating.blogspot.com/2009/11/craft-fair-donation-item.html ) It seems like the batteries get drained very fast, but maybe it is the type we bought - not sure!